Have you ever heard of print on demand (P.O.D.) affiliate programs? You create a free store, upload images, add them to shirts, buttons, hats, and other merchandise. You set your own markups and that becomes your commission when products are sold. The companies do all the printing and shipping, you just collect your commissions. Well, I just switched from Zazzle to Spreadshirt and increased my earnings by about 300%. My average commission per shirt sold is between $7 and $9. Updated! Take my Spreadshirt course here and learn how to make money like me! First of all, it reminds me of the opportunities available online and I wanted to do this podcast to help give you ideas — especially those of you who are in niches where there are not a lot of monetization options. People LOVE wearing shirts that allow them to express themselves. (Not to mention the selfies they may take, which can mean even more promotion for you!) The key is the sayings and designs. You really have to know what your audience would like. The second reason I’m pumped about this is I’m not much of a designer. So the fact that someone like me can open up Photoshop, take my basic knowledge of the program and create a design that sells makes me feel good. I create some designs myself and outsource others. PSSSST… Did you know you can get Photoshop for FREE? Yes! And it’s 100% legal. Watch the free “Preview” video near the bottom of my course landing page. Third, it’s fun! There’s something incredibly rewarding about knowing I can have an idea for a shirt, create something in 10 minutes and put it up for sale immediately. Gotta love the convenience of the Internet! And last but not least…when you have a site with traffic, the income can be very passive. The only direct promotion I’ve done for my shirts was Pinterest. Other than that, I am driving all the traffic to my store from links and images on my site and forum. 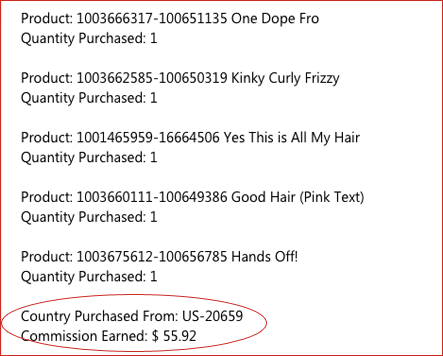 Update January 2015: I had a record commission ($55) for one order in December, 2014. I added a banner at the top of my store and reminded people that the shirts make great Christmas gifts. A few big orders came through around this time. I wish I had thought to put that banner up sooner! If you want to learn how to make passive income online like me or learn more about customizing your WordPress site and more, enroll in my online courses here! About 70% of my sales are generated from links on my site to store. The other 30% come from the Spreadshirt marketplace. 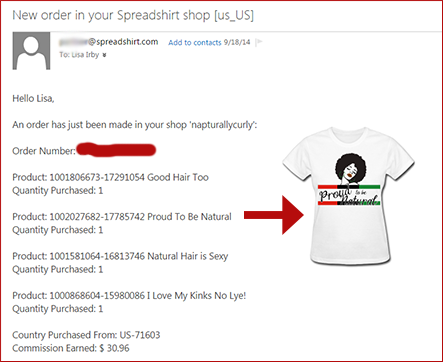 2) Some customers go to Spreadshirt.com directly to find images, put them on products and you also can earn that way as well. Imagine if I had used social media more (other than Pinterest). I probably would sell a lot more. I admittedly slack in that area, and because of that, my followers are not very engaged. 🙁 So I haven’t really tested anything beyond Pinterest. But if you do have an engaged social following, there’s a lot of opportunity there. 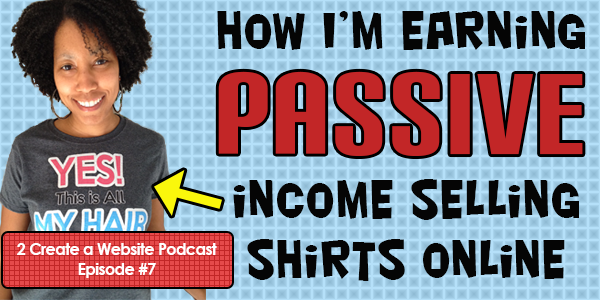 In the podcast, I discuss a YouTube channel I follow and how the owner uses social media to generate more sales for his Spreadshirt store. Check out the podcast below. Here’s the transcript. Lisa, I would love to be an affiliate for your course as I have a “tribe” that love Etsy and Print on Demand, as well as my own course. Yours is a bit different from mine, and I believe my subscribers would benefit. My email is kchiles@tds.net if you would like to chat about it, Thanks! Kristie Chiles PS. Love your blog and Youtube channel – great value!! Can we do dropshipping with the Tshirt business?? Amazon FBA?? I’m just starting my t-shirt business this year. I see there is a lot of value to using sites like Spreadshirt or teepublic. But I want to sell shirts independently, directly from my website. Does anyone have an opinion on the pros and cons of selling shirts via drop shipping websites versus selling from your own website using a site like Shopify? The con’s would be that it would all be on you. You would have to do all the customer service, the shipping, handing problems, ect. Could be time consuming. Also, would probably be higher costs involved, less profits. I am sure the big places get great deals on the shirts themselves, probably a break on shipping because of volume. You would do the printing yourself? Wold need equipment, ect. Pro’s “should” be more profit. But would it, you’d have to figure that all out. Material costs, equipment, shipping and most importantly, what is your time worth? Don’t want to be working for pennies an hour. Exactly and that’s why I don’t want to bother with all that. Yes it’s always nice to control the profits but I cannot imagine dealing with printing and customer service. To me it’s worth the cut in profits. I like a very passive model. Hi. I am getting started in this field. Can you compare this with Teespring and Sunfrog? I recently started designing t-shirts for the purpose of creating passive income. Thanks for this post…I’m going to check out some of your courses as well! Hey Lisa, my name is Henry from Kenya. Does the spreashirt affiliate program enroll members globally or is it only members from Europe and the States that are eligible to apply? Lots of thanks. You might want to check with them by contacting them through the support form. I’m not really sure. Read the reviews on both the Spreadshirt and Photoshop courses and you’ll see how people who never knew how to use it, have learned. The Spreadshirt course only focuses on the features you need to create your shirt in Photoshop (or Paint), but the Photoshop course covers more ground in the software, of course. But I don’t think you need both courses. If you just want to learn how to create images for your shirt, the Spreadshirt course will show you how easy it truly is. EPS format is really the best format, but truthfully, I never learned how to use Illustrator all that much. So I only use PNG for all my images and the quality is just fine. Lisa, you are such a dear. I had just started working on a Zazzle store a couple of days ago. And I so agree with you regarding the base price on the products and the structure of the commission. But I was about to go forward with the store anyway. After listening to this podcast, I’m going to check out Spreadshirt. I can kick myself for not listening to this when you first published it. I’m getting more serious about photography and am looking into how I can earn passive income with some of my work. This may be a great option. Thanks so much for sharing your experience. Do it! I have been so much happier with Spreadshirt. It’s crazy that it takes me months to earn with Zazzle what I earn in one day sometimes with Spreadshirt. And people always question the quality. Honestly I think the quality with SS is fine. The one thing I would critique is consistency. For example, I bought a white shirt in a size S and the sleeves were so tight on my tiny arms. Yet the purple shirt in the same size fit fine. So their sizing is a little strange and inconsistent across the colors. However the quality is not an issue. The print stays one through numerous washings. Love it! In your Udemy preview you mention your Spreadshirt course is for student who at least have a blog, soical following, Youtube channel. I do have a cat FB page with 750 followers but I only post and share funny cats pic or video. Not sure is it work for Spreadshirt. What if a person who doesn’t have any of the above you mention. Can he or she still can benefit from your course. I’m interested to enroll your course. Absolutely! Funny you just asked this today. I just sent out an announcement to my Spreadshirt students today announcing that I sold 6 shirts via my account that has no website attached (I have several Spreadshirt stores/accounts). You don’t earn as much if you don’t have a large following but you can earn. One of my stores is actually tied to a FB page I own. I show my Spreadshirt earnings from that store here. https://blog.2createawebsite.com/2015/10/15/earning-passive-income-online/ I also have a FB page for one of my accounts that I post funny pictures to and that’s where the sales came from. Interesting! Thanks! Looking forward to learn from you. I getting ready for Chinese New Year. After the festival, I’m ready to give it a shot! Hey Lisa, I getting started today on your Udemy Spreadshirt course. Pretty excited. Hi Lisa, I have gone through your paint and photoshop video. Very interesting. Just a quick quesion, is pixlr.com another option to create images? As long as you can create a high-res PNG file then you can use any program. I’m just not too familiar with Pixlr. Hi Lisa, I have complete your course and set up my store. I’m doing some or I say lot of changes to my site so can link up to my spreadshirt store. Great Cena!! Thank you so much. I saw your review. Appreciate it!! I HATE that Udemy uses Rakuten for the affiliate program. It’s not user friendly at all to get affiliate links. Got it, thanks! Thinking keywords ideas to put in my site on the weekend. I have been struggling to find work for a while now. I am running out of options. I have often thought about running a spredshirt shop, but am unsure. I am on a benefit at the moment so. Do you make alot of money from it to live? Or do people do it on the side of a job? Would I be able to come off my benefit to do this? This is definitely not something you do full time. It’s a part-time income generator for me. Lisa, Can I use free editing software like picmonkey to create designs for my t-shirt? Is it legitimate? Not sure. If you can create very large images with them (4000×4000 pixels) and save them as a high quality PNG then yes. Try to submit one image to the Spreadshirt marketplace and see if it gets accepted. hello lisa. I love your post about Spreadshirt. And it really inspired me to open a shop, and i did open one today. However, I have some issues regarding the IRS. Is it right that they require some income tax certificate or something like that? I don’t understand it. What is it? I’m not quite sure if what I understood was right. I’m having some doubt . I hope you could help me, big thanks. A certificate? Not sure what you mean but yes, all affiliate programs require your SSN or Tax ID so they can report your earnings if you make over $600. Looks interesting and pretty doable, Lisa! I’ll take you up on that coupon offer in about two weeks. In the meantime, I’ll try to figure out what my theme will be, as well as my target. As always, thanks for all your helpful tips! comments/ posts of 13 may should be displayed before comments/posts of april/march/feb etc. because when a new person visits the site he may feel that blog is not updated and this can hamper your reputation as an active blogger . Hey! Did you create a course for selling on Spreadshirt? I think you mentioned doing that in this podcast. Not yet. Working on it now. I knocked out 7 videos yesterday. If you’re on my email list you’ll be notified when it launches. Thanks so much for this. I’d never heard of Spreadshirt. This is an interesting business model, I will definitely check it out. i just send some of my designs to apreadshirt yesterday . i hope to get some passive income soon too. this is also new to.me. Thanks for openly sharing the good advice, I am convinced that the good karma will come back ten fold! I get bogged down with technicalities so thanks for answering the question above with 4000 pixel size and png format. My question is this, which tshirt company did you find has the best quality prints? I want to print photos of animals for example and cut them out (so I will have transparent background), but some of the companies I came across dont print photos because apparently they contain too many colors. Do you make tshirts with pictures? Or only clever text in a few colors? Nice info on Spreadshirt, file size question: Can you tell me what file size and resolution you upload when designing a text type shirt? and file format? jpg, png etc. No prob. Yes, I’ve found that 72 dpi works just fine and I always use the max file size (4000×4000 pixels). I only use PNG. And the reason 72dpi works for me is my images typically don’t have a lot of detail. They are usually flat text or cartoon images. But if you are working with images that have more detail, you might have to increase this. Thanks Lisa, another question, should have tagged on my initial ask. Font size, if you use an image size of 4000 x 4000, 72 dpi, what is a good size to use if you’re going to have a 1 or 2 line statement/saying on a Tshirt? Can you see how the font size is going to look on the shirt as far as the scale? No worries. I try to make it as large as I can. I know that sounds vague, but I don’t pay attention to the actual font size number (because I normally use the Transform tool in Photoshop instead of the numeric font value.) I just drag the text container so it’s large enough. And if you are using 2 or more lines of text, you really want to make sure it’s large enough. Remember, people are seeing a smaller version of the shirt and I find that sometimes the ones with too much text don’t sell as well. If you notice, a lot of my shirts are not very wordy. And if I do have multiple lines, there is not a lot of text on each line. That is done strategically. Here’s another tip. Do a search for the kind of shirt or theme you going for in Spreadshirt. The top selling shirts show up first. So if you do a search for birthday shirt, notice a theme with the text. Most shirts use larger fonts and if there are multiple lines, the words are minimal on each line. Studying what is selling in your niche is a great strategy and has helped me a lot. Also keep in mind some are top sellers simply because they have been out there a long time. So it doesn’t always mean they are selling a lot right now. But it’s still a good trick to use and will give you an idea of what people like. Hello Lisa, I am impressed with how profitable Spreadshirt has been for you. Good for you! It all sounds so simple. Thanks for the information and value you add. Hi Lisa. I really enjoy your material. Do you get to keep the rights to your designs for your shirts? Yes you own all rights to images you create which means you can also sell them on other sites like Zazzle, CafePress, offline, etc. Just dropped by to say i have opened my Spreadshirt stores . . . two of them, and I’m so glad i came across your article which made understand how to use the site, thereby giving them a second try. I have been having a stream of visits, but no sales yet, but i’m optimistic and patient. LOL! Yaaay! Also keep in mind sales pick up in the warmer months so don’t give up if sales are slow during the Winter. Enjoy and good luck with your sites! Hi Lisa, Great podcast. Did I miss your affiliate link to Spreadshirt on this page? Seems every link I’ve clicked takes me to your website Napturally Curly, which is great, but I’d like to go to Spreadshirt through your affiliate link so that you can get the commission. Could you point out your link for me on this or another page? Thanks Charlotte but there is no affiliate program to sign up for Spreadshirt so that’s why there’s nothing there. But thanks for asking!! 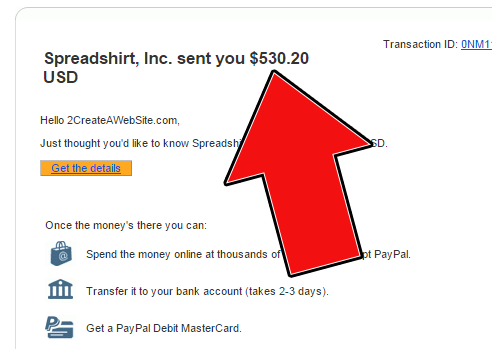 How long did it take Spreadshirt to send you your first check?